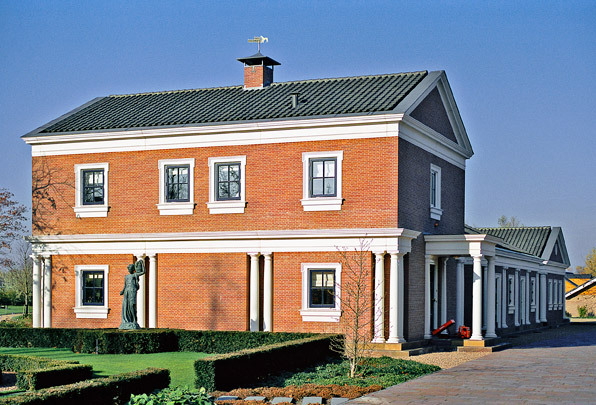 This private house is set in the rural borderlands between Rijswijk and Delft. By building on only one of the two available plots, the house could be set square to the adjoining road leaving the other plot available as a garden. Though neoclassical in idiom, the house makes use of the very latest technical advances. Its outward facing facades are clad in a special size of reddish-brown brick and its gently pitched roofs covered with blue ‘Old Dutch’ roofing tiles. The pillars in the facade sport Doric capitals.